Agility describes the ability to change direction and move at speed, whilst maintaining control and balance. This innate flexibility and adaptability aptly describes an athlete, a boxer or a cheetah, yet this description can be (and is) readily applied in a business context. Whilst the telecoms industry is not usually referenced as a model of agility (and is often described as the opposite), a number of business strategies and industries have adopted more ‘agile’ approaches, attempting to simultaneously reduce inefficiencies, maximise the deployment of resources, learn though testing and stimulate innovation. It is worthwhile recapping some of the key ‘agile’ approaches as they inform our and the interviewees’ vision of agility for the telecoms operator. When introduced, these approaches have helped redefine their respective industries. One of the first business strategies that popularised a more ‘agile’ approach was the infamous ‘lean-production’ and related ‘just-in-time’ methodologies, principally developed by Toyota in the mid-1900s. Toyota placed their focus on reducing waste and streamlining the production process with the mindset of “only what is needed, when it is needed, and in the amount needed,” reshaping the manufacturing industry. The methodology that perhaps springs to many people’s minds when they hear the word agility is ‘agile software development’. This methodology relies on iterative cycles of rapid prototyping followed by customer validation with increasing cross-functional involvement to develop software products that are tested, evolved and improved repeatedly throughout the development process. This iterative and continuous improvement directly contrasts the waterfall development model where a scripted user acceptance testing phase typically occurs towards the end of the process. The agile approach to development speeds up the process and results in software that meets the end users’ needs more effectively due to continual testing throughout the process. More recently the ‘lean startup’ methodology has become increasingly popular as an innovation strategy. Similarly to agile development, this methodology also focuses on iterative testing (replacing the testing of software with business-hypotheses and new products). Through iterative testing and learning a startup is able to better understand and meet the needs of its users or customers, reducing the inherent risk of failure whilst keeping the required investment to a minimum. The success of high-tech startups has popularised this approach; however the key principles and lessons are not solely applicable to startups but also to established companies. Despite the fact that (most of) these methodologies or philosophies have existed for a long time, they have not been adopted consistently across all industries. The digital or internet industry was built on these ‘agile’ principles, whereas the telecoms industry has sought to emulate this by adopting agile models and methods. Of course these two industries differ in nature and there will inevitably be constraints that affect the ability to be agile across different industries (e.g. the long planning and investment cycles required to build network infrastructure) yet these principles can broadly be applied more universally, underwriting a more effective way of working. This report highlights the benefits and challenges of becoming more ‘agile’ and sets out the operator’s perspective of ‘agility’ across a number of key domains. This vision of the ‘Agile Operator’ was captured through 29 interviews with senior telecoms executives and is supplemented by STL analysis and research. One of the main (and often voiced by interviewees) barriers to achieving greater agility are legacy systems. Dealing with legacy IT systems and technology can be very cumbersome and time-consuming as typically they are not built to be further developed in an agile way. Even seemingly simple change requests end in development queues that stretch out many months (often years). Therefore operators remain locked-in to the same, limited core capabilities and options, which in turn stymies innovation and agility. The inability to modify a process, a pricing plan or to easily on/off-board a 3rd-party product has significant ramifications for how agile a company can be. It can directly limit innovation within the product development process and indirectly diminish employees’ appetite for innovation. It is often the case that operators are forced to find ‘workarounds’ to launch new products and services. These workarounds can be practical and innovative, yet they are often crude manipulations of the existing capabilities. They are therefore limited in terms what they can do and in terms of the information that can be captured for reporting and learning for new product development. They may also create additional technical challenges when trying to migrate the ‘workaround’ product or service to a new system. Figure 6: What’s Stopping Telco Agility? 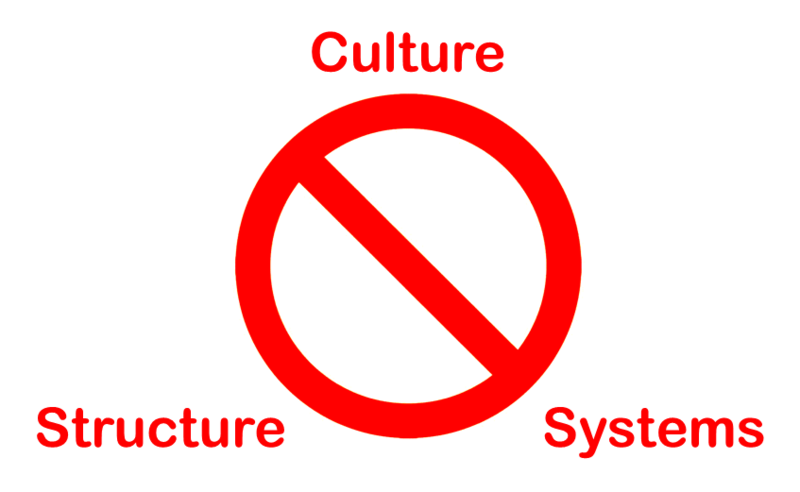 The historic (incumbent) telco culture, born out of public sector ownership, is the opposite of an ‘agile’ mindset. It is one that put in place rigid controls and structure, repealed accountability and stymied enthusiasm for innovation – the model was built to maintain and scale the status quo. For a long time the industry invested in the technology and capabilities aligned to this approach, with notable success. As technology advanced (e.g. ever-improving feature phones and mobile data) this approach served telcos well, enhancing their offerings which in turn further entrenched this mindset and culture. However as technology has advanced even further (e.g. the internet, smartphones), this focus on proven development models has resulted in telcos becoming slow to address key opportunities in the digital and mobile internet ecosystems. They now face a marketplace of thriving competition, constant disruption and rapid technological advancement. This classic telco mindset is also one that emphasized “technical” product development and specifications rather than the user experience. It was (and still is) commonplace for telcos to invest heavily upfront in the creation of relatively untested products and services and then to let the product run its course, rather than alter and improve the product throughout its life. Whilst this mindset has changed or is changing across the industry, interviewees felt that the mindset and culture has still not moved far enough. Indeed many respondents indicated that this was still the main barrier to agility. Generally they felt that telcos did not operate with a mindset that was conducive to agile practices and this contributed to their inability to compete effectively against the internet players and to provide the levels of service that customers are beginning to expect. Organisational structure and internal processes are closely linked to the overall culture and mindset of an organisation and hence it is no surprise that interviewees also noted this aspect as a key barrier to agility. Interviewees felt that the typical (functionally-orientated) organisational structure hinders their companies’ ability to be agile: there is a team for sales, a team for marketing, a team for product development, a network team, a billing team, a provisioning team, an IT team, a customer care team, a legal team, a security team, a privacy team, several compliance teams etc.. This functional set-up, whilst useful for ramping-up and managing an established product, clearly hinders a more agile approach to developing new products and services through understanding customer needs and testing adoption/behaviour. With this set-up, no-one in particular has a full overview of the whole process and they are therefore not able to understand the different dimensions, constraints, usage and experience of the product/service. Furthermore, having these discrete teams makes it hard to collaborate efficiently – each team’s focus is to complete their own tasks, not to work collaboratively. Indeed some of the interviewees blamed the organisational structure for creating a layer of ‘middle management’ that does not have a clear understanding of the commercial pressures facing the organisation, a route to address potential opportunities nor an incentive to work outside their teams. This leads to teams working in silos and to a lack of information sharing across the organisation. A rigid mindset begets a rigid organisational structure which in turn leads to the entrenchment of inflexible internal processes. Interviewees saw internal processes as a key barrier, indicating that within their organisation and across the industry in general internal decision-making is too slow and bureaucratic. Interviewees noted that there were too many checks and processes to go through when making decisions and often new ideas or opportunities fell outside the scope of priority activities. Interviewees highlighted project management planning as an example of the lack of agility; most telcos operate against 1-2 year project plans (with associated budgeting). Typically the budget is locked in for the year (or longer), preventing the re-allocation of financing towards an opportunity that arises during this period. This inflexibility prevents telcos from quickly capitalising on potential opportunities and from (re-)allocating resources more efficiently. Where is it important to be agile?